It may seem a little harsh when you win that free holiday that the IRS Taxes comes knocking on your door asking you to pay tax on it. Well, unfortunately one of the hidden costs of doing sweepstakes is that you must pay taxes on sweepstakes winnings. So if you don’t want to have IRS tax problems be informed. The implications of not recognizing the need to pay taxes on sweepstakes winnings can be significant. You may be doing sweepstakes to supplement your income because you do not have much spare cash for those kinds of luxuries. Well, if you win some nice prizes be warned that they could come at a heft price as the taxes on some of the higher end physical non-monetary prizes could be significant. 1. Keep good records of all your wins. It may help to record in a book information about the name and sponsor of each of the sweepstake contests, along with the date of payment or receipt of each of the prizes as well as their value. 2. By law any sponsors that give out prizes in excess of $600 will need to give you a 1099-MISC form. You will need to keep copies of these as they will be required when you come to fill out your tax form at the end of each tax year. 3. Record the market value of each win, as tax is payable on the fair market value rather than the cost to the sponsor. 4. If you enter many sweepstakes you may be incurring expenses such as telephone costs or mailing costs. You may wish to speak to a professional to see whether you should consider doing sweepstakes as a business so you can deduct these expenses from your winnings for tax purposes. 5. If you have many high value wins you should consider seeking professional help with your tax return as you will be required to submit all your sweepstakes information at that time and this can be quite complicated. 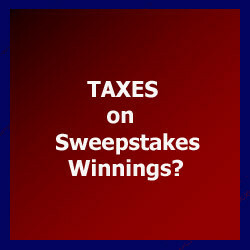 We certainly hope that you are successfully enough with your sweepstakes to have to pay taxes on sweepstakes winnings. We are sure with a bit of careful planning and assistance, you will not only be able to avoid difficulties with the IRS but be able to enjoy all the hard work you have put in. If I win big will have to keep money in a seperate account for it . Hey if I get more than I do now will be pleasure . If I win a vehicle will have to take loan for car taxes too I guess but cheaper than buying one and will not worry about getting stranded, with my 18 year old van. Thank You PCH ahead of time. 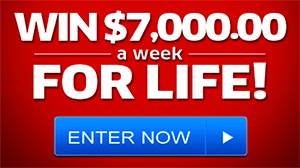 Could sure use the 2,500 week lifetime prize, to help out my wonderful children and some charities around here too. So many good works, and so many in need of a helping hand. I know it’s the right thing to do to avoid problems with the IRS. Greetings from William Roberts Jr. Just make my dreams come true, and I will immediately pay taxes to IRS.and the state of Raleigh North Carolina, immediately Pch, Merry Christmas and a Happy new year. ERNELL. ROSS. I am. Blessed. VIP standing! Can’t wait to win I have prayed for the chance to have financial freedom to help my family and friends,and of course hubby and GOD is always giving to those who ask I have asked and I’am believing that he has already opened the bank vault for this family.Thank you PCH for helping people. You see the Dream is my Dream. I am the “WIN IT ALL!” Winner Keep trying maybe next time it will be you. Q. What would be the amount of a person who win a prize from the lest to the max who has only Social Security and to what amount additional would there be after federal tax, state tax (if any) of that state, because some states have no state income tax. So please address; Social Security,+ Federal + State (if any state tax or not) and what would be the amount say on ten million, one million for life, etc. Thank You TJ.